Shiyr is partnering with Victress to bring an original play to Theatre Row this July. Stay tuned for the big announcement. Our unique party-theatre, interactive experience featuring original comedic plays in rooftop bar was a great success. The 6 show run featured 3 guest actors, 3 company members, 5 playwrights and more laughs than the audience was ready for! Nights featuring short plays are common in NYC but Shiyr Shorts is anything but. Photos and Audience Feelings HERE. Shiyr in partnership with company member, Tamra Paselk, is producing an original comedic web series. The pilot episode is tearing it up on the Film Festival scene having been selected for numerous festivals and taking home several awards! Up next: an exciting partnership with Palikari Pictures will open doors for episodes 2, 3 & 4. Follow The BLEEP Year Old on FACEBOOK or learn more at www.bleepyearold.com. Laughter + Conversation + Nachos + Support = Joy Bloating (We promise it's a good thing.) We’ve so enjoyed these mixers and know they were gratefully received, as well. We’re done for the year but we’ll be back in 2019. As always, at Jack Demsey’s! We love where we grew from (hint: The William Esper Studio), so in 2017 we produced a show to raise funds for students in need. Over the course of 2018, it was our great honor to have made continued education possible for 5 students at our alma mater. We believe in the importance and power of the arts and are so glad to have had the chance to give back. In October 2017, we produced our first ever, fully staged writers' workshop! Eleven playwrights put their pens to paper (well, fingers to laptops) and came up with some seriously funny stuff. 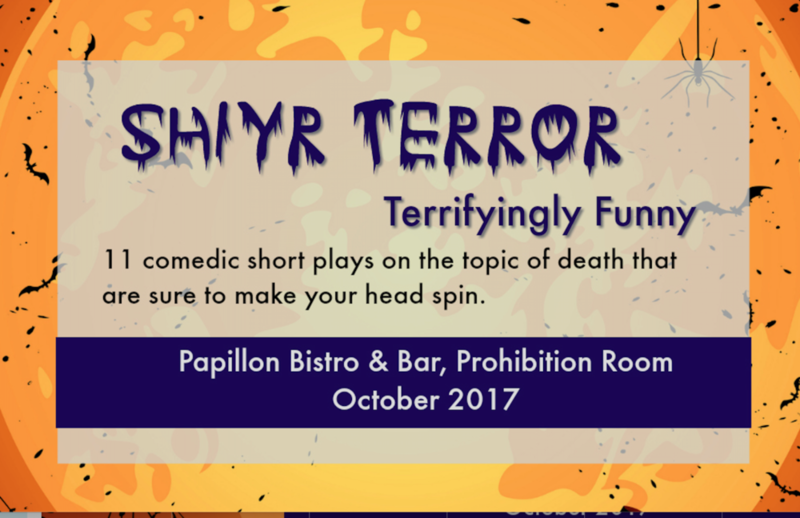 Then, 7 actors brought the characters to life in one and a half hours of comedic terror in our favorite room at Papillon's Bistro & Bar. After 5 sold out shows, we and the audience left feeling lighter than we came and looking forward to many collaborations ahead! In April 2016, we brought one of our very favorites by George Bernard Shaw. Always the crowd favorite, we were received by sold out and happy crowds at Papillon Bistro & Bar. The brilliance of Shaw never ceases to amaze and, as you may know, we're doing this show around town in homes near you! Shoot us an email at info@shiyr.org for more information!